When only ravishingly hot pink roses for mum will do... 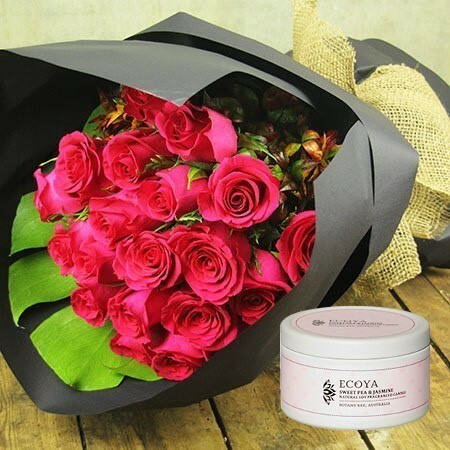 Send roses in a divine bright pink offset with lush foliage and a smart black wrap for Mothers Day and receive a FREE ECOYA CANDLE worth $15.95. Available in three bouquet sizes, these fabulous pink roses are perfect for making mum feel like the legend that she is! You can order our darling pink roses online or by calling the florist team on 1800 66 66 46. Ps. If mum has a sweet tooth this bouquet would go perfectly with a bar of Kennedy & Wilson chocolate from our delectable chocolate gift range, just saying! *Please note: The pictured rose bouquet is our `Deluxe` 20 stem option. This offer is available for Sydney metro flower delivery only.